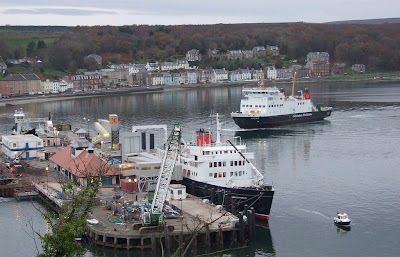 Rothesay Pier is the setting for these two pictures, a pier which is undergoing a major transformation with the installation of a new end-loading linkspan, seen just behind HEBRIDEAN PRINCESS. As that berth on the pier is still classed as a construction site, the cruise ship had to use her tenders to land her passengers at one of the yacht pontoons in the inner harbour, surely the first time a vessel lying at a pier has been unable to use it for passengers! Astern of HEBRIDEAN PRINCESS is the CalMac ferry BUTE, built in Poland in 2005, and about to leave on one of her scheduled crossings to Wemyss Bay. 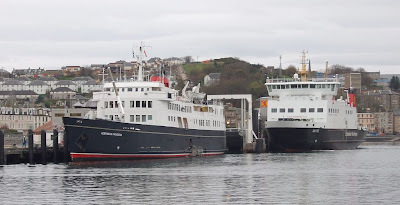 Another view of HEBRIDEAN PRINCESS alongside Rothesay Pier, this time with one of her tenders on its way round to the inner harbour, and the ferry ARGYLE arriving from Wemyss Bay. She too was built by the Remontowa shipyard in Poland, and took up service in the CalMac fleet in May 2007. At the far end of the pier the Highland Council ferry CORRAN is completing her annual overhaul, having recently been slipped at Ardmaleish Boatyard, a few miles to the north of Rothesay.